Chris Helme looks at the third and final part of the remarkable story of one of the movements greatest ever brass banding families - the Oughtons who can claim over a century of brass players in their ranks. PART THREE � Whilst William Jnr and his brother Cecil were brilliant players in their own right the concluding part of this story concentrates on their brother Robert (Bobby) Oughton who was a virtuoso cornet player of the highest standard and a musical director of some of the top brass bands of the time. Robert Oughton was born on the 11th August 1920 at 55 Sunderland Street, Brandon, County Durham and was the second son of William and Violetta Oughton. Following the death of his mother in 1927 William took his two youngest sons to live in Dalmellington. Moving to a new home and community meant he and his brothers had to enrol at a new school. Robert began his new school life at Dalmellington High School (now known as Doon Academy). Shortly after his eighth birthday he was introduced to the world of brass bands when his father began to teacher him the rudiments of cornet playing. By the time he was 12 years old his early talents were self evident and as the years went by it was apparent to all that he was destined to a career as a musician. In 1935 he auditioned and was appointed the Assistant Principal Cornet player to the renowned Elgar Clayton at Munn and Felton's Band and then in 1937 he was appointed the Principal Cornet player at Grimethorpe Colliery Band � a position which was rumoured to be the highest paid �end chair' cornet player at that time. It was not long before he was on the move again in those pre-war days, this time he went to Blackhall Colliery under the baton of Noel Thorpe where he stayed from 1938 to 1941. After his war time service he went to the Ransome and Marles Works Band as their new Principal Cornet player (1946 � 1959). Back in those days Robert and James Scott seem to follow each other around from one top band to another � as Robert left Grimethorpe his place was taken by James for a short while before he went on to Munn and Felton's Band. James can remember the day he was given his Grimethorpe Colliery Band uniform � the tunic still had the name of the previous occupant in it �Robert Oughton'. James recalled that Robert was not known for being profligate ways which were highlighted the day he was given his Grimethorpe band tunic. James mentioned to Ray Craggs (one the band's bass players) that the leather tab that went under the hook and eyes of the choker collar was missing � to which Ray replied "That's because Bobby cut the piece of leather out of the collar to cover a hole in the sole of his shoe". 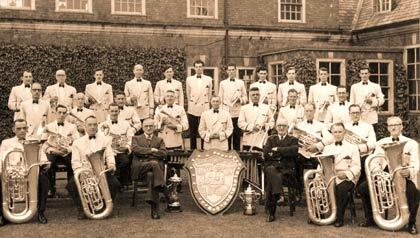 The Ransome and Marles Works Band which was located in Newark, Nottinghamshire was formed in November 1937. The company was a well-known bearings manufacturer and a major employer in the community. As with most works bands in those days all the band members were employees at the company. In the first ten years of the band's life it built up a reputation of musical excellence both within the brass band world and with the public. In 1939 Ransome and Marles Works Band made the first of over 500 radio broadcasts. Such was the popularity of the band's music that the BBC installed a direct radio link to the works canteen from where many of the popular musical programmes ofthe time were broadcast. These broadcasts included favourites such as �Music While You Work', �Workers' Playtime', �Friday Night Is Music Night' and �Strike up the Band'. The band's first appearance at the annual National Brass Band Championships in London was in 1945 the first event following the end of the war and they have appeared many times during what were the halcyon days for the band and into the present era. Maintaining the continuity of players has always been vitally important to a brass band � this was epitomised during those post war years when the turn over of players was rarely more than one or two. The Ransome and Marles Works Band were no different from any of the other top bands of that era - the rarely changed team for them in those days included: Ken Johnson, Robert Oughton, Len Kitchen, Alec Sykes, William M. Oughton, Donald Roscoe, Robert W. Smith, Ronnie James, Robert English, Brian Harvey, George Stoves, David Parr, Fred Willis, Jack Kearsley, Geoff Tomlinson, William Connell, Tommy Hinson, William Walton, J. Edward Hunter, Andy Veal, Harold Seddon, Jack Smith, William Chaplain, Les Ward, William Glew, Allan Richardson, Ernest Tetley, J. Hall, Neil Emerson, Sam Hursthouse, and John Absalom. The band was in great demand for radio and in July 1952 they were even invited to take part in the relatively new media of television. On that day for over five hours the Ransome and Marles bandsmen perspired under blazing arc lamps in a Birmingham BBC studio working on a 20-minute tele-cast, part of TV Children's Hour. A short report in the local newspaper said: Mr David Aspinall, conductor of the 27-piece works band, described being under the cameras as "�an unforgettable experience..."
"We were working for five hours on the set before they had the cameras and lights fixed in the right positions. There seemed to be hundreds of technicians every where . . . it was like a factory." The bandsmen wore no make-up, but had special cream jackets made with the initials �R. and M' on the breast pockets and banners with the same initials were draped in front of the stands. "This was the first time a brass band has played a full musical programme on television," said Mr. Aspinall. "Bands have been on before, and the instruments have been described to viewers but Ransome and Marles are the first to give a complete programme"
One item - "Trombones to the Fore" - showed the Newark trombonists in close-up. Robert Oughton, the band's solo cornetist, played one of his own arrangements, and Sam Hursthouse, drummer, (as he was referred to in those days) gave a xylophone solo � a memorable day for all concerned. Recession loomed and in 1980 the company was no longer able to continue its financial support but fortunately the Band was able to secure support firstly from Browns Musical of Lincoln and then Airquick (Newark) Ltd. This lasted through the 80's until the early 90's. However, 1991 was traumatic in that Airquick (Newark) Ltd was unable to continue with its valuable support. The decline in funds mirrored the band's rapid decline and it was becoming a struggle to maintain a band at all. At one point there were only 9 stalwart members remaining. In 1992 the heartbreaking decision was made to dissolve the band and let the traditional Ransome name lapse. The Band's final concert was in the grounds of the Castle in the centre of Newark and the last number they played was ��Old Comrades�' - there was not a dry eye to be seen. Fortunately news of the band's imminent demise found its way into the local press. When the town of Newark and the band's loyal following heard the news, there was an outcry that provoked a very positive action. Newark Town Council and other local representatives got together with a package of support which enabled the Band to continue its championship and concert activity for the next few years - Newark Town Council is still a loyal supporter of the Band today. In 1994 major sponsorship was received from NSK-RHP (UK) Ltd, who ironically was the successor to the original Ransome and Marles and it would now seem that fate had completed a circle. It was in 1996 when Brian Grant was appointed their Musical Director and in the November of that year the Band was invited to attend the 80th anniversary celebrations of N.S.K. in Tokyo, which both the Band and the Japanese audiences hugely enjoyed. In 1997 the Band qualified for the National Finals at the Albert Hall in London by becoming Midland Area Champions for the first time since the 1950s. In the same year the Band qualified for the British Open Championships at the Birmingham Symphony Hall for the first time since 1979 and entered the rankings for the brass band movement at number 32 and as a result of its hard work and dedication the Band is now in the top twenty. During their history the Band has made numerous LPs and during the last few years it has made 4 CDs which have proved hugely popular with the band's loyal supporters and the general public. As the band goes from strength to strength I am sure Robert Oughton would be pleased to see it back at the forefront of the brass band movement. 1999 was a very active and successful year for the Band yet again with the first highlight being crowned the Midland Area Champions which gave them qualification into the National Brass Finals in October at The Royal Albert Hall, London. This success brought them an invitation to compete at the All England Masters Championships, the British Open Championships at the Birmingham Symphony Hall and also the top entertainment contest at Spennymoor in County Durham. In June 1999 the Band was invited to play at the Glen Miller Festival in Clarinda in the U.S.A a performance that proved a huge success with the audiences. They also performed a concert at the Michigan Theatre in Ann Arbour Detroit where the band played for invited guests from the N.S.K. Corporation. In 2000 the Band became runners up at the National Finals at the Albert Hall in London which made them the English Champions. This fantastic result qualified the Band to play at the European Championships in Montreaux in Switzerland in 2001 and again, to play in the Nationals in 2001. In 2001 the Ransome Band appointed Russell Gray as its Musical Director and Professional Conductor. 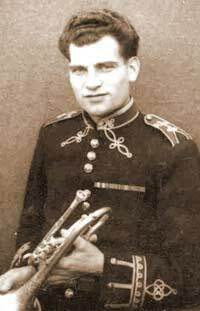 Between 1935 and 1939 Robert was the Champion Cornet player of the North of England with medals won at Derby in 1935, Leeds in 1936, Bury in 1938 and Oldham in 1939. These medals are now proudly displayed in the Dalmellington Band bandroom. During the war he served with the Scots Guards Band but in 1945 he declined to sign on for another tour but he did sign on with the Royal Signals and was with the Royal Corps of Signals Band for two years under the Musical Direction of Lieutenant Colonel Judd (1943-1962). In 1946 the Royal Signals Band were on tour in the United States of America � in the band at that time was Sir Alexander Gibson (1926 � 1995) who was then serving his compulsory National Service and later in life was the conductor of the Scottish National Symphony Orchestra. At one of the Royal Signals concert Robert Oughton played the well known cornet solo �Pandora' and as an encore he followed that with �Fairies on the Water'. Unbeknown to Robert in the audience was Rapael Mendez the legendary Principal Trumpet player with the Metro Goldwyn Meyer Film Company Orchestra. It is reported that Sir Alexander Gibson introduced Robert Oughton to Rapael Mendez and over the years they became friends resulting in Robert Oughton acquiring some of the Mendez solos and then re-arranging them with a brass band accompaniment � they corresponded with each other for many years. Following his �demob' day in 1947 he returned to the Dalmellington Band but within three months he was back with Ransome and Marles. For the next twelve years many of these arrangements were then used on the radio broadcasts and in concerts he did throughout the country with the Ransome and Marles Works Band. I was pleased that I recently acquired some of his old recordings on a reel to reel tape and have now successfully transferred them on to CD � a showman indeed. He was still the showman in 1972 when he played with the Dalmellington Band and performed the Post Horn Gallop on a live television programme. He played the opening with the Post Horn in the traditional manner but finished it off to an amazed television audience with his mouthpiece attached to the hollow tube of a music stand. In the early 1950's he was a member of the Harry Mortimer's ��All Stars Brass Band...' which was a group of forty of the top brass band players in the country. Another cornet player who remembers those days with Bobby Oughton is Derek Garside who was the Principal Cornet player for CWS (Manchester) Band for 25 years. In those days Derek recalls that Robert was about ten years older than he was and considered him one of the more established members and star players in the brass band world. In view of his seniority and the fact Derek was still one of the new boys in the �All Stars Band' he rarely spoke to Robert unless he actually spoke to him first. Derek considered him to be a very good technical player - a good cornet player. However, as a person he was considered to be rather aloof to the rest of the band and was a person who preferred his own company � didn't really mix with everyone else- very much a private person. It was 1964 when Robert first appeared on the big stage as a conductor when he was the Musical Director of the Scottish CWS Band and led the band to the Royal Albert Hall National Championships. The famous cornet player and Principal Cornet at he CWS in those days Willie Barr well remembers his old friend from those days and has many happy memories of Bobby coming to his house for tea and talking about the old days. Even though Scottish CWS Band were unplaced on that occasion he was back at he Royal Albert Hall the following two years firstly with Kinneil Colliery Band and then in 1968 with Kirkintilloch Band. A story about his conducting from his early days was that as most conductors were still wearing the traditional conductor's uniform some of the professional conductors were beginning to move away from this type of uniform and wear a lounge suites � black jacket and pin striped trousers. It has been said that Robert was the only conductor who conducted his bands wearing a lounge suit and wearing white gloves and wore them at Whit Friday Contests. In 1970 he was appointed the Musical Director of Carlton Main Frickley Band, a position he was to hold for the next five years. Whilst he took them to the Royal Albert Hall in both 1971 and 1973 and the British Open Championships from 1970 through to 1975 he was in the prizes only once. The band's best performance came on Saturday 2nd September 1972 - the test piece was Jack Beaver's test piece �Sovereign Heritage'. Playing off number 16 they were awarded second place behind the champions Black Dyke Mills Band. One of those players in Carlton Main Frickley Band that day was the well known Tuba Soloist, Conductor and Adjudicator Steve Sykes and he has very happy memories of that day. It was in his early days of playing in the newly re-formed Carlton Main Frickley Colliery Junior Band that he first met Robert Oughton. Jack Atherton stepped down as the Musical Director and Robert Oughton was appointed as his replacement in 1969/70. One of the first things he did was to re-start the old junior band that had ceased to exist many years earlier. It was thanks to his father Bill Sykes who was colliery manager at Carlton back in those days who volunteered his son Steve to be one of the junior band's first members. A move that saw Steve take his first tentative step on to the brass band ladder and who has over the years become one of the leading tuba players in the country. Memories about Robert (Bobby) Oughton are plentiful Steve recalls but the level of respect he received from all the young lads who joined that new band is high on his list of memories from those days. In 1976 Robert had moved back to Scotland and was back at the Royal Albert Hall having come full circle when he conducted the Dalmellington Band. It was following the death of his father in 1961that he made his first visit to the Faroe Islands and became involved with the Havnar Hornorkestur (Torshaven Band). His second trip to the islands came during the late 1970's and the early 1980's when he was involved in helping to coach the band again. Robert is still remembered today in the Faroe Islands. On Wednesday the 29th June 1995 Robert Oughton died, alone at his home in Forfar and returning to the beginning of my story it was that Saturday in July when Hugh Johnstone MBE proudly conducted a scratch Dalmellington Band at his funeral. I have been told by many people that Robert Oughton had many personal problems towards the end of his life the details and reasons for those are not for this story. So let us not dwell on the sad side of his life but remember those brass playing musicians from the Oughton family who all made a significant contribution to the world of brass bands in England and Scotland. Their individual playing was of the highest calibre and can be heard in the few solo recordings that still survive. "�You have a wicked left eye�you know�" - the story goes that he did not respond to the passing comment but just before he raised his baton on the contest platform he took out of his pocket a black eye patch and said "�Is that better�" and conducted the test piece throughout wearing the black eye patch. These practical jokes for a man who was so private dated back to the days when he was at Ransom and Marles Works Band. When the band was taking part in a live radio broadcast and as the floor manager counted the band down to the start of their opening piece the Musical Director would raise his arm and baton aloft ready to bring them in only to find that someone (usually the person sat nearest � Bobby Oughton on Principal Cornet) had tied a flag or a piece of coloured ribbon to the end of the baton and with the count down well under way David Aspinall had to conduct the opening music with the flag or ribbon attached to the baton flapping in the air as he beat out the time � you can imagine his thoughts on such a practical joke. I would like to take this opportunity of thanking all those people who have helped with the research enabling me to tell this remarkable story. In particular I must thank Hugh Johnstone MBE who has had a life time in brass bands and knew the Oughton family personally for many years and is pleased to have been considered their friend. I am looking out for any of the few old 78's that William Mathew Oughton recorded with St Hilda's Band - if you have one please let me know. A recent story of mine was Arthur Laycock the famous St Hilda Colliery Principal Cornet player � in 1983 a record was produced from some of the original St Hilda Colliery Band recordings including two tracks of Arthur Laycock as the featured soloist � if anyone is interested in purchasing one of these records please contact me. The records have never been played and including p/p is �9 and are the las from the original production run. His brother Harold the celebrated St Hilda's and Callender's Cable Works Band Principal Trombone only every recorded 6 solos. I am now trying to track down copies of these solos for Harold's daughter and grand-daughter � if you have them tucked away in the dark corner of a cupboard I would be very pleased o hear from you. and finally�I do receive many e-mails from around the world saying how much my nostalgic stories are appreciated � I will take this opportunity to say thank you � I also get receive many questions and queries about other brass band legends and old brass bands and as they say - ��keep them coming..'.